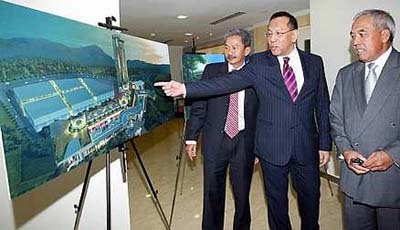 Kuala Lumpur: Developer UEM Land Holdings Bhd says its Nusajaya township, the key driver of the Iskandar Malaysia emerging economic zone in Johor, is on track to "come alive" in 2012 as targeted. UEM Land is the master developer of Nusajaya, which is a tenth the size of Iskandar, but the largest integrated urban development in Southeast Asia. "In 2012, there'll be enough critical mass and completion of projects. Post-2012, a new demand structure will evolve ... and with that, comes better profits," managing director Datuk Wan Abdullah Wan Ibrahim told reporters here yesterday. Projects that are expected to be completed include the Coastal Highway, which will improve accessibility to Nusajaya. This is expected to be done by the end of this year, ahead of schedule, he said. Healthcare-wise, there is already Columbia Asia Hospital, while Khazanah Nasional is poised to start on a 350-bed hospital soon. As for education, Newcastle University Medicine will open this year, and next year, University of Southampton will be completed while Netherlands Maritime Institute of Technology will take on a new campus, Wan Abdullah said. Theme park Legoland Malaysia will be completed in September next year, while an indoor theme park that is in the advanced stage of construction at Puteri Harbour will be completed by year-end. As for residential occupancy, there are currently 20,000 homes occupied, which works out to a population equivalent of 100,000, he said. The ultimate plan is for Nusajaya to have 100,000 homes over time, or a population equivalent of half a million. Wan Abdullah was speaking at an event to formalise its subsidiary UEM Land Bhd's 55:45 joint venture with Iskandar Harta Holdings Sdn Bhd to develop a mall-and-residence project in Medini, Nusajaya. The project, known as the Lifestyle Retail Mall and Residences @Medini North, is expected to generate sales of RM850 million. "This is one of our initiatives to build up a portfolio of recurring income to weather any (property) downcycle," he remarked. The first phase of the mall is targeted for completion in September next year to coincide with the opening of the Legoland, which is a 200-metre walk away. Visitors have to go through the mall to get to Legoland, Wan Abdullah said. The Iskandar project was launched in 2006 to much scepticism about its viability and prospects. OSK Research, in a report earlier this week after attending a conference that centred on the developments in Iskandar, said it has turned optimistic on its prospects. "We gather that just like the majority of us, when the entire (Iskandar) project was first launched in 2006, the locals had been sceptical, but have over the years progressively turned more optimistic, especially after witnessing the progress that Iskandar has made to date," it said in the report. It maintained an "overweight" call on the property sector and said that given the "favourable" outlook for the property market in Iskandar, it had a preference for property developers with sizeable exposure in Iskandar such as UEM Land, SP Setia Bhd and Plenitude Bhd. Johor project: Wan Abdullah, Iskandar Investment president/CEO Datuk Syed Mohamed Syed Ibrahim and UEM Land Holdings chairman Tan Sri Ahmad Tajuddin Ali discussing the project after the signing ceremony. 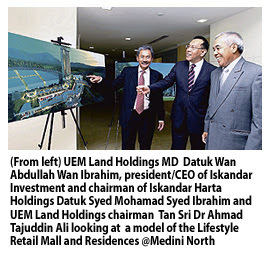 KUALA LUMPUR: UEM Land Holdings Bhd, the real estate investment and development company of UEM Group, is collaborating with Iskandar Investment Bhd, the main property developer for Iskandar Malaysia, to develop retail and residential units in Nusajaya, Johor with a gross development value of RM850mil. Both parties signed a shareholder agreement yesterday through their subsidiaries UEM Land Bhd and Iskandar Harta Holdings Sdn Bhd. UEM Land Holdings managing director/chief executive officer Datuk Wan Abdullah Wan Ibrahim said a new company called Nusajaya Lifestyle Sdn Bhd had been formed to develop and manage the project. “UEM Land owns 55% equity interest in that company while the remaining is under Iskandar Harta,” he said at a press conference after the signing ceremony. Wan Abdullah said the project, known as Lifestyle Retail Mall and Residences @ Medini North, is located in Medini North, Nusajaya on 35 acres which Nusajaya Lifestyle had bought earlier at a cost of RM100mil. “The entire development will have a total gross floor area (GFA) of 2 million sq ft combining colonnade-style retail outlets, entertainment facilities, shopping mall and service apartments,” he said. He added that phase 1A of the project, which comprised colonnade-style retail outlet and alfresco dining with GFA of 200,000 sq ft would be completed in September 2012. “A large-scale quality retail offering is an integral part of any urban development as it will improve the quality of life and boost the demand and value of surrounding properties,” he said. Wan Abdullah said the overall development of the project was expected to be completed in eight years and the project was part of the group's plan to build up its recurring income portfolio to weather the downside of the market. 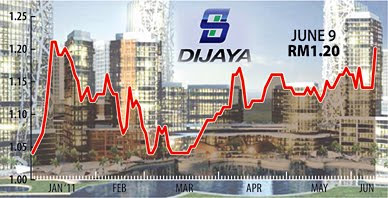 PETALING JAYA: SP Setia Bhd's net profit for the second quarter ended April 30 surged 80% to RM92.22mil from RM51.21mil a year earlier due to a gain arising from the disposal of an investment property. Revenue for the period increased to RM496.75mil from RM409.07mil a year earlier. In a note to Bursa Malaysia yesterday, the company said its profit and revenue were principally derived from its property development activities carried out in the Klang Valley, Johor Baru and Penang. “Ongoing projects which contributed to the group's profit and revenue include Setia Alam and Setia Eco-Park at Shah Alam, Setia Walk at Pusat Bandar Puchong, Setia Sky Residences at Jalan Tun Razak, Bukit Indah, Setia Indah, Setia Tropika and Setia Eco Gardens in Johor Baru and Setia Pearl Island and Setia Vista in Penang. “Apart from property development, the group's construction and wood-based manufacturing activities also contributed to the earnings achieved,” it said. For the six-month period ended April 30, net profit increased to RM154.26mil from RM89.41mil a year earlier while revenue rose to RM1.02bil from RM772.97mil previously. SP Setia also declared a gross interim dividend of five sen per share in respect of the financial year ending Oct 31, 2011. On prospects for the current financial year, SP Setia said it had continued to set new sales benchmarks, with second-quarter sales of RM671mil and cumulative six-month sales of RM1.41bil. SP Setia also said total sales of RM1.66bil for the first seven months of the financial year had surpassed the full-year sales achieved in every year of the company's history, except for the RM2.32bil recorded in FY10. Working together: (From left) Eu, Viacom International Media Networks executive VP Indra Suharjono, Dr Ng, MTV VJ Holly and I-Bhd executive chairman Tan Sri Lim Kim Hong marking their strategic partnership. KUALA LUMPUR: I-Bhd is looking to create sustainable income sources for i-City by tapping into the tourism market. Apart from its sole property investment in Shah Alam, the company is looking at opportunities to invest in international events and functions to boost i-City's image locally and globally. i-City now has about 90,000 visitors each week, of whom 90% are locals. I-Bhd CEO Datuk Eu Hong Chew said there were plans to push up the number of foreign visitors so that tourism would eventually become a recurring income source for the company even after fully developing i-City. The company was collaborating with MTV Networks Asia to strengthen i-City's positioning as a family leisure night tourism spot in the Klang Valley, Eu said yesterday in an event to mark the strategic partnership between both companies. The event was witnessed by Tourism Minister Datuk Seri Dr Ng Yen Yen. The partnership will see a multitude of activities by MTV as well as Nickelodeon, targeting youths as well as children. I-Bhd has allocated US$5mil for advertising and promotions with MTV and Nickelodeon from March this year to the next. “This partnership is a significant investment but it's not so much about the financial investment but time, effort and commitment put into making this work,” he said. Eu is looking at the partnership from a brand positioning point of view rather than as revenue contribution. “If we were to promote i-City to various countries, it would need a lot of money so we're leveraging on international events like MTV World Stage,” he said. “Right now, we want to bridge the gap between content and digital technology at i-City,” he said, noting that the location had attractive visual technology while MTV would have the content to draw the audience. Under the partnership, i-City will become the host for MTV World Stage Live in Malaysia 2011, an international concert featuring pop stars from abroad and here. The concert will be held on July 24, with an expected crowd of 50,000. Eu also said that he looked forward to tie-ins with MTV Networks Asia's parent company, Viacom International Media Networks, for their online games and other entertainment platforms. According to Eu, the gross development value of i-City will be RM2bil. He revealed that RM200mil had been spent on the project so far, resulting in 20% development of the 72-acre land. KUALA LUMPUR: Although shares of UOA Development Bhd had a poor debut recently, analysts don't think other listings will suffer the same fate. They think UOA's stock performance was due to the property market having reached its peak while the initial public offering's (IPO) valuation leaves little upside on the first day of trading. The stock closed 1 sen lower at RM2.59 on Wednesday and continued to fall yesterday, shedding 6 sen to RM2.53. "The property market upswing cycle has reached near to its peak, even if this does not imply a downswing cycle will begin shortly," Jupiter Securities head of research Pong Teng Siew told Business Times yesterday. Interest rates are expected to continue rising, which makes it more expensive for people and businesses to buy properties. Mercury Securities head of research Edmund Tham attributed the lack of excitement to the developer's weak branding. However, this does not imply the start of a spell when all IPOs will do badly, Pong said. The stock market is due to welcome more listings this year. MSM Malaysia Holdings Bhd, a sugar producer, is scheduled to be listed on June 28 while oil and gas service provider Bumi Armada Bhd is reportedly planning to raise about RM3 billion in an IPO this year. Pong also cautioned that rich valuations will be hard to support without the help of foreign investors.